Lord Executor- The Master Of Extempo. Welcome to The Roaring Lion’s Official Webpage. October 10th 2017; Trinidad Guardian: The Age of Atilla & Roaring Lion revisited. 14th February 2017: Roaring Lion (Rafael de Leon) remains the sole singer to have scored four consecutive victories from 1935 to 1938 singing gems such as Netty Netty, and Dingolay Oy. He tasted success one final time in 1941 with Whoopsin, Whoopsin. RLF would like to make a point of clarification. This article says that Lion won Road March on 4 consecutive occasions but in actual fact Lion won 5 Road Marches consecutively. The Calypsos that are mentioned above are correct but his first Road March was in 1934. It was called “Wanga” and it was a massive hit, popular with the Music bands and Dance halls of the time. Wanga was played on the road for several years after 1934. February 16 2016: Its back to the classics for UTT’s Ibis Ensemble! The Ibis Ensemble of UTT will perform a free concert of early calypsos by Roaring Lion, Growling Tiger, Houdini and Atilla the Hun as well as early instrumental pieces by Lionel Belasco and Lovey’s Band. This concert titled Capturing Calypso, takes place tomorrow at the UTT Campus Theatre 1, at Napa from 7 pm. June 30 2016: Son of Calypso Music legend Roaring Lion to lecture at the Holocaust museum Florida. May 19th 2016: “Chinee Patrick” emerged in the first decade of the twentieth century and in his heyday he did battle against songsters like “Fijonel”, “Executor” ,and “Chieftain Douglas”. In a 1956 interview with American folklorist Emory Cook, Chinee Patrick recounted a 1920s lyrical “war” against Lord Executor, then regarded as the preeminent extemporizer (“extempo artist) in the land and the true successor to “the greatest extempo calypsonian of all time”, the “Senior Inventor” (Henry Forbes). January 2016. Blue Boy pays tribute to the Roaring Lion and other Calypso Greats in his 2016 release called “We Calypso”. 28.10.15. This is a very rare footage of Calypsonians Lord Caresser, Roaring Lion & Growling Tiger from ca.1936. This picture is the copyright of RLF. 1.10.15. The month of October is Calypso History month in Trinidad & Tobago. 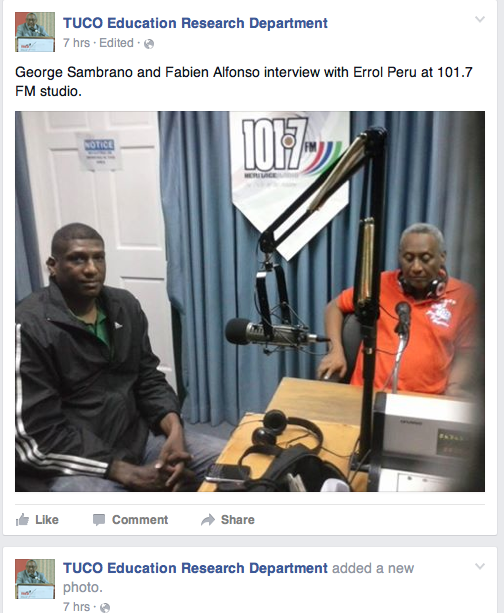 RLF is using Face Book & the radio to contribute to this celebration. RLF has ran a segment several times a week for three weeks on WACK radio 90.1 fm. The theme is about “The significance of the year 1934 in Calypso history”. This segment will be loaded up to youtube before the end of October. 1.9.15. RLF aired a “World War II Calypso” series on WACK Radio 90.1 FM Trinidad. Different segments of the series were also aired three times a week for the entire month. The segments have since been uploaded onto RLF’s YouTube channel. RLF also posted on Facebook a rare picture postcard depicting Calypsonians and musicians from 1949. This post card was porduced by RLF. All copyrights belong to RLF. 9.5.15. Happy Mothers Day Calypsos !! Happy Mothers Day Trinidad & Tobago women all over the globe !! 12.3.15. 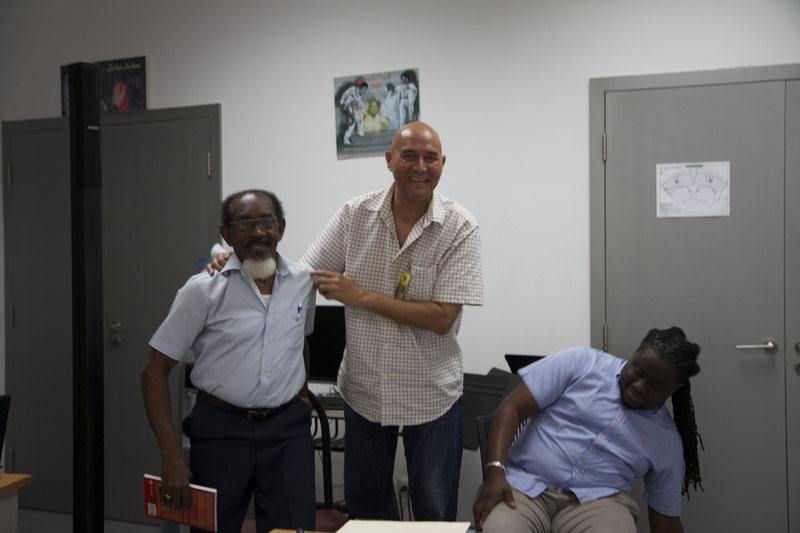 Mr Fabien Alfonso and Mr. de Leon from the Roaring Lion Calypso Foundation(RLF) were invited by Dr. H. Liverpool “The Mighty Chalkdust” to present a power point lecture for Master degree students at UTT; the University Of Trinidad & Tobago at NAPA, about “Milestones In The Development Of Calypso” between 1900-1950. 3.3.15. 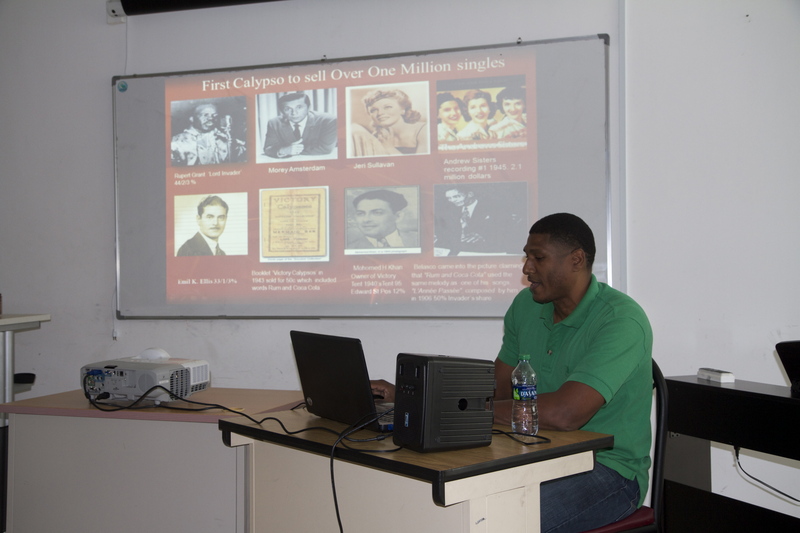 Mr Fabien Alfonso and Mr. de Leon from the Roaring Lion Calypso Foundation(RLF) were invited by Professor Desmond Waith to present a power point lecture for Bachelor degree students at UTT; the University Of Trinidad & Tobago at NAPA, about “Milestones In The Development Of Calypso” between 1900-1950. On December 25, 2014, an article on “Lord Executor -The Master Of Extempo” was published. News!!! 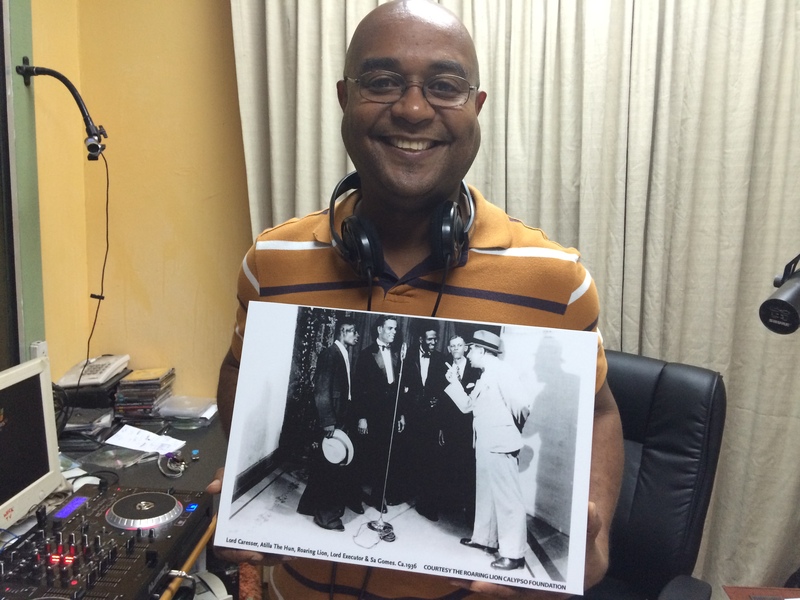 On September 23, 2014 – RLF aired a “World War II Calypso” series on WACK Radio 90.1 FM Trinidad. Different segments of the series were also aired on Tuesdays and Sundays for a period of four weeks. The segments have since been uploaded onto RLF’s YouTube channel. 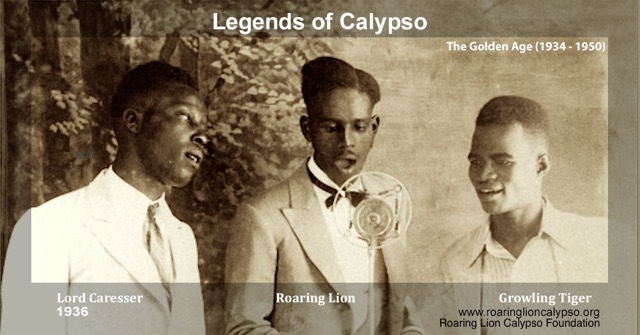 The 3 Calypso Kings-Lion, Kitchener & Sparrow speak about times gone by. Caribbean Beat Magazine on Calypso & Roaring Lion. Pope John Paul II’s visit to Trinidad & Tobago, captured by the Roaring Lion in song. 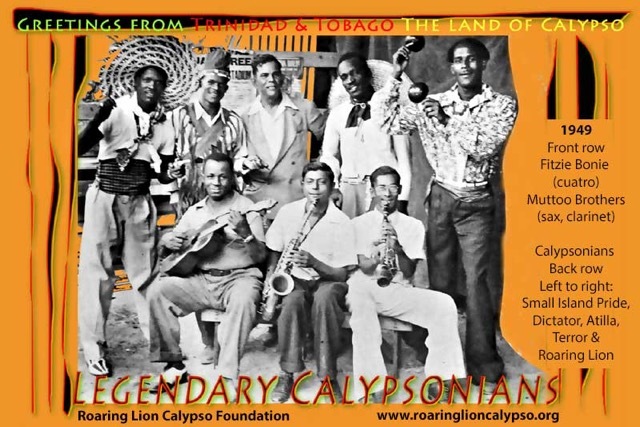 Roaring Lion Calypso Foundation (RLF) wants to research, collect and make available songs, song texts and history about the Golden Age of Calypso (1934 & 1950). This period is characterized by the arrival of a cadre of at bright Primary school educated men, the development of facilities like the “Calypso Tent”, professionalization of calypsonians, access to recording facilities and business sponsorship for local and international promotion of the art form. RLF will endeavor to make our rich “Golden Age Calypso” history better known to the general population of Trinidad & Tobago. RLF intends to use social media as a medium to exchange a multitude of perspectives on our calypso and carnival history. RLF will use radio campaigns to highlight the “Golden Age of Calypso” nationally. Roaring Lion left historical information about the era in both written and audio format, and this will be made available to the public in different ways. RLF will seek to get “Golden Age Calypso History” into the syllabi of the primary and secondary schools. 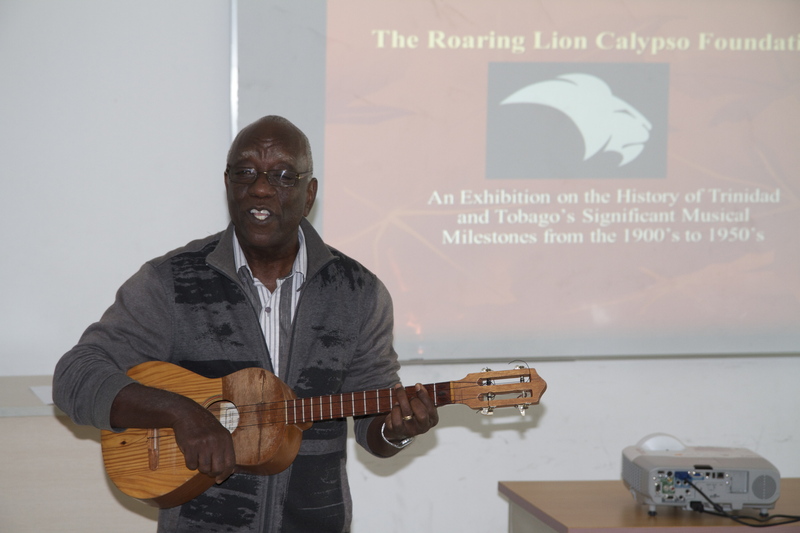 RLF believes that many of the era’s calypsos have a literary, poetic, social and historical value for Trinidad and Tobago, and should be studied by the nation’s youth. Educational authorities can easily compare, assess and identify calypsos of worth, and impart this knowledge onto our youth. RLF will continue working with projects that enhance and promote our culture and country.